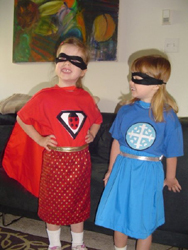 My second and third sewing projects where these ‘superhero’ costumes for the girls. 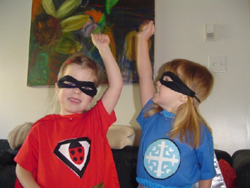 They had a superhero party at daycare and I asked them who they wanted to be. 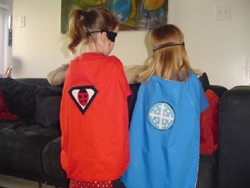 Little A is Ladybug Girl and little G is Freeze Girl. Things are beginning to line up in both the knitting and sewing department for Halloween – yes already! 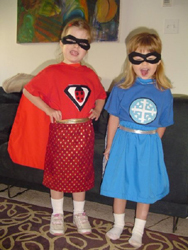 They are lovely costumes Louise,you have 2 lovely girls there. Thanks Cheryl! It was quite to project for me since I’ve just begun learning to sew. I was just so happy to see how excited the girls where when they put the costumes on. 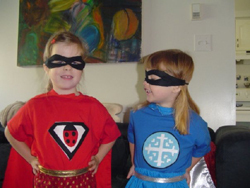 Well, freeze girl is easy, but what’s the superpower of ladybug girl?